Ottawa County’s system of parks and open spaces is made possible by voter support of the Ottawa County Parks & Open Space Millage. A 10-year, 0.33-mill County Parks millage was first approved in 1996 by 53.5% of voters and then was renewed for another 10 years in 2006 by 67% of voters. We are happy to announce that on August 2, 2016, the millage was renewed and restored by 72.3% of voters. The millage will provide funding for improving, operating, maintaining, and acquiring parks and open spaces in Ottawa County from 2018 through 2027. Is the millage the only source of parks funding? No. 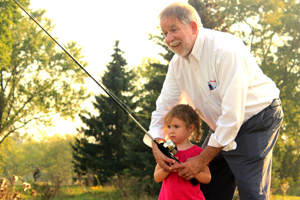 While the millage is the cornerstone, Ottawa County Parks diversifies its funding by charging user fees where appropriate, use of partnerships, efforts to secure gifts and donations and continued aggressive efforts to secure state and federal grants. Parks received $530,000 annually from the Ottawa County general fund until 2010, at the peak of the financial crisis. The newly formed Ottawa County Parks Foundation will provide the means for community members to expand, improve, and diversify the county park system as strategic opportunities arise. Ottawa County Parks is able to stretch the budget due to the generous support of volunteers who contribute more than 10,000 hours of their time and energy every year. Accomplishments the parks millage made possible since 2008. Over 1,200 acres of land added to the park system. Olive Shores County Park was purchased and developed, providing more public access to Lake Michigan. The Nature Center at Hemlock Crossing opened, serving as a visitor and learning center for all ages. 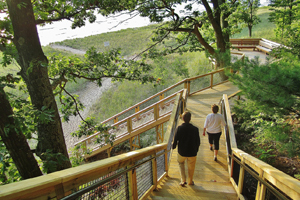 Trails, parking, and other improvements were completed at North Ottawa Dunes. A wide range of work was completed at Historic Ottawa Beach including dune stairs and overlooks, waterfront walkway, fishing docks and renovation of the historic pump house building. Connor Bayou was developed as a county park with trails, restored cabin, fishing, and picnicking. The Upper Macatawa Natural Area was expanded and park improvements were completed, including parking lots, restrooms, and a diverse system of trails for hiking and biking. Eastmanville Farm was developed with parking, equestrian trails, interpretive displays, and renovation of the historic barn. 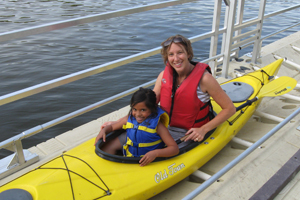 The Grand River Heritage Water Trail was established and a series of three universally accessible kayak docks were installed. Master planning and park improvements were completed at Riley Trails. A new 172-acre Paw Paw Park was established by acquiring the former Holland Country Club and combining it with the original Paw Paw Park, which was leased from the City of Holland. Major habitat restoration work was completed, and park facilities were added including trails, disc golf, and picnicking. Acquisition and development of Grand Ravines provides scenic views along the Grand River and the largest free, off-leash dog park in the area. Here is a very broad overview of our projects for the next decade. Continued emphasis on good stewardship and high-quality maintenance at all parks and open space lands. 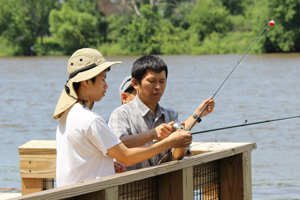 Expanded nature education programs and educational opportunities for all ages. 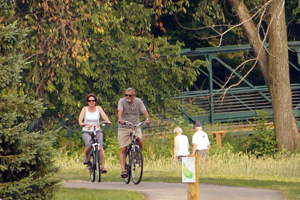 Complete the Grand River Greenway, a 28-mile pathway connecting Grand Haven to Grand Rapids (and many parks in between), including acquiring remaining key lands and easements and developing connecting trail. Develop master plan and complete improvements at the Crockery Creek Natural Area, including an expanded trail system. Continued progress on Macatawa Greenway, including land and easement acquisition and trail extension. Expand the Bend Area in Georgetown Township and develop first phase improvements (learn more about the grant submission on the next page). 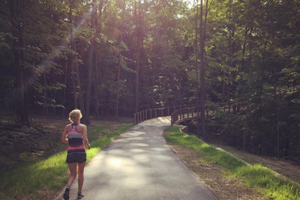 Expand and improve Pigeon River Greenway lands, facilities, and trails. Further improvements to Grand Ravines following the park master plan. As needed, renovate existing facilities including resurfacing parking lots, re-building stairways and boardwalks, renovating restrooms, and other improvements to keep parks in excellent condition. Maintain and improve accessibility of parks for persons of all abilities. If you have any questions about the millage proposal, please call (616) 738-4810 to speak with Parks staff. Thank you!